Xiaomi stunned everyone this year by launching the Mi Mix, which can be called as the most beautiful phone of 2016. The superb screen-to-body ratio and design made this device one of its kind. Now, we are hearing a lot of rumors that some Chinese companies like Huawei, Elephone, etc. are also coming with their concept phones. Well, Huawei is the 3rd largest smartphone manufacturer after Samsung and Apple and well, the Honor Magic i.e., company’s first concept phone was in news for almost a month. 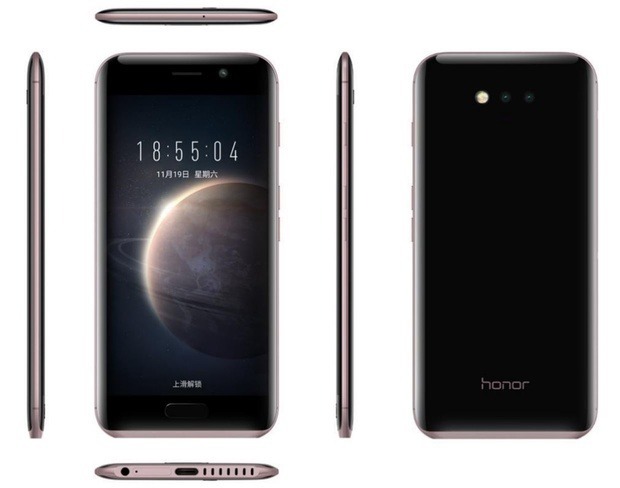 Now, the company has put a stop to all the rumors and finally the Huawei Honor Magic has been announced. If you don’t know, Honor is the sub-brand of Huawei and is exclusive to online markets. The honor lineup consists of smartphones that are manufactured & marketed by Huawei. Well, that was a little introduction to Honor. Anyways, coming to today’s news, the Honor Magic has been officially announced and the phone looks really stunning! As we believe in ‘less words, more information’, here are the specifications of the device. The Honor Magic comes with a 5.09 inch AMOLED display with a resolution of 2560×1440 pixel. The pixel density is 577ppi which means the screen quality is amazing. Coming to other specs, the phone is powered by a 2.3GHz octa-core Kirin 950 chipset, manufactured by Huawei itself. There is 4GB of RAM and 64GB of internal storage space. Coming to cameras, there is 12MP dual lens rear shooter with f/2.2 aperture. Also, on the front is an 8MP camera with f/2.0 aperture. Under the hood, the Huawei Honor Magic has 2,900 mAh battery which in my opinion is very small for a screen with such high pixel density! The phone has a lot of sensors that include Hall effect sensor ,Fingerprint sensor ,Proximity sensor, Ambient light sensor, Compass, Accelerometer, Phone status indicator and lastly, the Gyroscope. Unfortunately, there is no Android Nougat as the phone still runs Marshmallow with custom UI of company. The device is available in two colors i.e Golden Black and Porcelain White. Talking about measurements, the phone is 7.8mm thin and weighs about 145 grams. Specs-wise, it cannot be said to be a very big upgrade by Huawei as we have seen hthe same chip on the Honor 8. But, what makes the Honor Magic different is its extra features! The phone will automatically unlock when you take it out of your pocket. Also, it will be automatically locked when you put it in pocket or purse. Also, the dual front camera will allow the notifications visible to only those users whom the camera recognises. This is great for the security. Also, the phone’s battery can charge upto 70% in only 20 minutes and 40% in just 10! Woah, that is amazing!